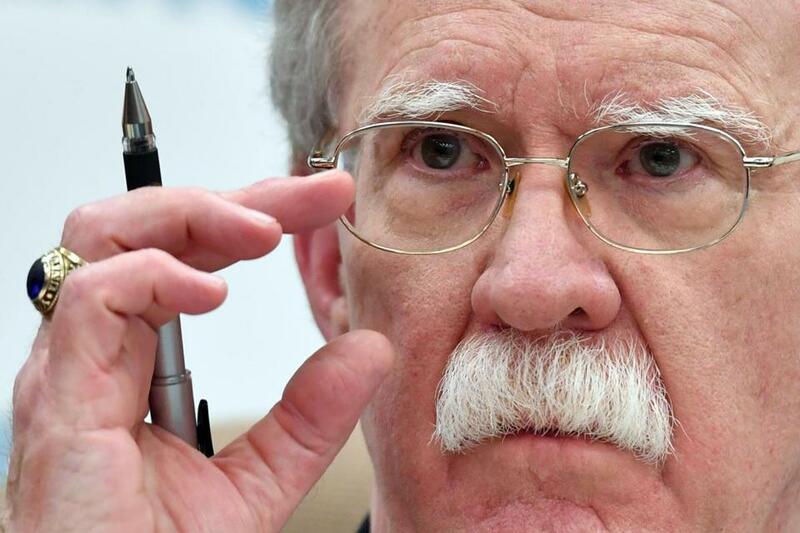 President Trump and his hard-line aides, particularly John R. Bolton, the national security adviser (above), have long disparaged the Intermediate-Range Nuclear Forces Treaty, asserting that Russia has cheated on its terms and that it should include China, which is not a signatory. Alarmed at what they see as disintegrating curbs on nuclear weapons, a bipartisan array of American nonproliferation specialists has urged President Trump to salvage a Cold War-era treaty with Russia that he has vowed to scrap. In letters sent to the White House this week that were seen by The New York Times, the group said the pact, the Intermediate-Range Nuclear Forces Treaty, had reduced the risk of nuclear war. Despite the treaty’s flaws, the specialists said, the United States should work to fix the accord, not walk away from it. “The INF Treaty has prevented the unchecked deployment of nuclear missiles in Europe,” stated one of the letters, sent Wednesday to the White House. It was signed by more than a dozen prominent figures in arms control, including former secretary of state George P. Shultz and former senators Richard Lugar and Sam Nunn. There was no immediate comment from the Trump administration on the letters. The treaty’s fate may come up this weekend if Trump sees President Vladimir Putin of Russia during a memorial event in France celebrating the centennial of the end of World War I. But there have been conflicting accounts from the White House and the Kremlin on whether the two will even meet. Putin and his subordinates have warned of a new arms race should Trump make good on his pledge to renounce the accord. It would be the first time Trump has scrapped an arms-control treaty, American officials have said. Many European leaders also have objected to Trump’s plan. Trump and his hard-line aides, particularly John R. Bolton, the national security adviser, have long disparaged the treaty, asserting that Russia has cheated on its terms and that it should include China, which is not a signatory. The treaty ended a crisis of the 1980s that had come to be seen as a hair trigger for a nuclear war. The Soviet Union had deployed a missile in Europe called the SS-20, capable of carrying three nuclear warheads. The United States had deployed cruise and Pershing II missiles. All had the capability of reaching targets in as little as 10 minutes. The Soviets were particularly fearful of a strike that could obliterate them before they could retaliate, further raising the possibility of a mistake or misunderstanding that could lead to an unspeakable outcome. Under the treaty signed in 1987 by President Ronald Reagan and Soviet leader Mikhail S. Gorbachev, all land-based cruise or ballistic missiles with ranges of between 311 and 3,420 miles were prohibited. On Thursday, Gorbachev said efforts must be taken to prevent a new arms race. Gorbachev, 87, told reporters that Moscow and Washington should focus on mending their rift and improving their relationship, one he described as the most important in the world. Gorbachev said that ‘‘I hope that the arms race could be stopped and we could continue the nuclear disarmament’’ that he and Reagan initiated. The United States has contended for years that Russia has violated the treaty by deploying a prohibited missile, the SSC-8, that threatens European nations. The Russians have argued that US anti-missile batteries in Europe violate the treaty because they can be used to fire offensive weapons at Russia. Bolton, who visited Russia a few weeks ago to explain the Trump administration’s decision to abandon the treaty, called it outdated. But he did not specifically rule out the possibility of a renegotiation. Both letters also urged Trump to engage in negotiations with the Russians on prolonging the New Strategic Arms Reduction Treaty, or New START, which will expire in February 2021 unless both sides agree to an extension. That pact limits the number of long-range missiles, bombers, and warheads in the American and Russian arsenals.